On January 17, the Regional Manufacturing Institute (RMI) brought together a cross-section of Maryland business, government and academic thought leaders to discuss, with an audience of 200, the impact of “industry 4.0” on Maryland Manufacturing. Industry 4.0 is the term used to describe the Fourth Industrial Revolution, a new period in history marked by digitization and advanced technologies (Google Industry 4.0). Thought leaders included: Aris Melissaratos, Dean, Brown School of Business and Leadership, Stevenson University; Suzy Ganz, Chairman and CEO, Lion Brothers; David Eschbach, Senior Project Leader- Smart Factory, Stanley Black & Decker; Mary Steinebrunner, General Manager, Dunlop Protective Footwear USA; George Davis, CEO, TEDCO; Adam Porter, Director, Fraunhofer USA – 4.0 and W. Donald Walker III, Branch Manager, Baltimore Kelly Services. Industry 4.0 tools allow companies to use data and analytical tools to help drive decision making. The impact is real as companies are reporting significant increases productivity through various real-time data feedback loops. Adopters of digitization report that data are now being shared in a cross-functional way allowing executives to have a 360-degree view of their operation based on analytical data previously unavailable. 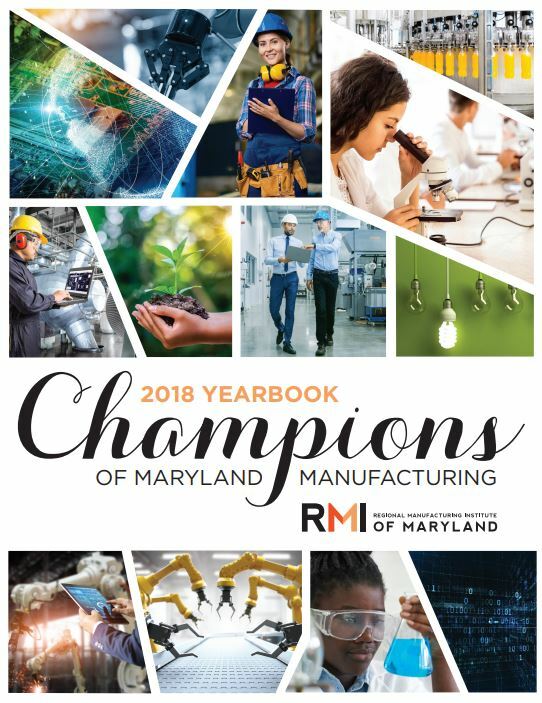 “Industry 4.0 principles, practices and technologies will transform Maryland manufacturing into a national showcase of next-generation manufacturing unequaled in stature and global competitiveness,” said Dr. Mike Galiazzo, President of RMI. Maryland manufacturers are keen to find out what they need to do and where they need to start. 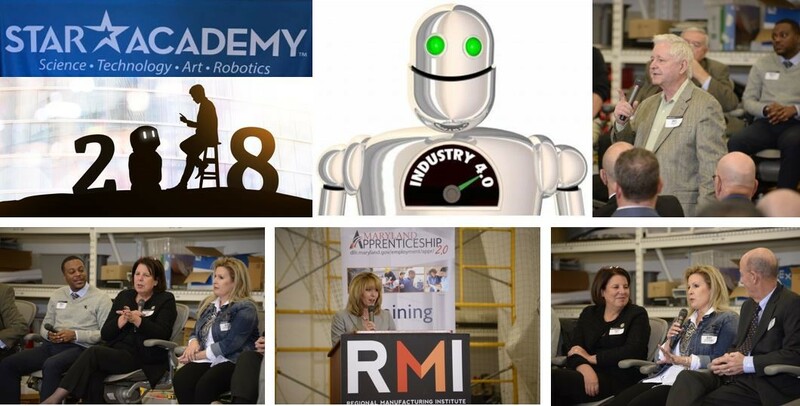 Over the past year, RMI has been leading an Industry 4.0 initiative, acting as a convener for Maryland manufacturing companies to share their thoughts on the value of becoming more digitally-integrated. The January 17 program provided some excellent examples of companies attaining very tangible and measurable impacts on their productivity and innovation. The forum also helped gauge their adoption of many of the new 4.0 technologies in their workplace and what kinds of resources they require to continue their journey. Several manufacturers are showing the way to 4.0 through their respective journeys including Lion Brothers, Dunlop Boots, and Stanley Black & Decker. With the Star Academy in Timonium as the backdrop with its showcase of robots, drones and virtual reality equipment, some of Maryland’s top visionaries gave their insights on the digitization movement. “The Industry 4.0 adoption for Lion Brothers was a 180-degree journey which has focused on employees of all ages and experience levels, from millennial to veteran employees and looking at new ways of doing things,” said Suzy Ganz, Chairman and CEO of Lion Brothers in Reisterstown, Maryland. “Our success to date reflects an integration and amalgamation of our smart talent and all of their ideas,” she said. Lion has been on the digitization journey which took them from threading looms to create patches in the early years, to today where they have become the leading designer and manufacturer of apparel brand identity systems using the latest digital technologies for manufacturing and customization. “Last year we grew our revenues by 55%, and we now have margins more like a tech company as opposed to a legacy company,” she said.